A slight modification of the camera [Bijou] "is now made to suit our friends of the wheel: we mean the bicycle riders." As cameras became smaller and more portable over the years, the marriage of cycling and itinerant photography probably started with the introduction of Anthony's Bicycle Camera. Interestingly, one of the first schools to teach the art of riding was opened in 1868 by Frank and Alva Pearsall, brothers who would later become famous photographers owning competing galleries. But at that time, photographic apparatus was not yet instantaneous for snapshots as well as much too large and unwieldy for wheelmen. 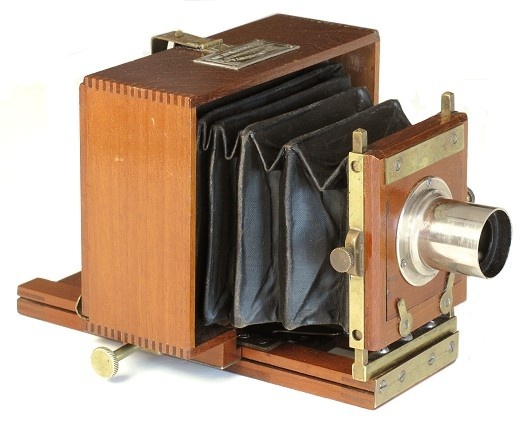 Anthony introduced the Bicycle Camera in 1885 when high wheel bicycles were immensely popular and amateur travel photography was coming into its own. To make it attractive to cycling enthusiasts, Anthony advertised a Bicycle Equipment outfit: Everything wheelmen would want; small camera with lens, camera mount, and even an optional telescoping brass rod that turned a high wheel bicycle into a make-shift camera stand. Anthony stuck with the belief that cycling and photography were destined to be together and continued to advertise the Bicycle Camera until at least 1895. Scovill, Anthony's competitor, also felt that the "two amusements are now often combined," and offered its own Pocket Photographic Outfit for Bicyclists in 1892. Bicycle Equipment. 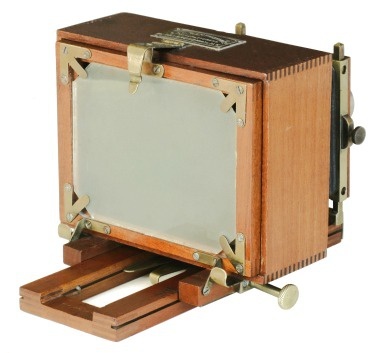 3-1/4 x 4-1/4 inch format. Small size apparatus intended for "Friends of the Wheel"
Ironically, it would be the Rochester Optical Company and not Anthony or Scovill to win the public over with the introduction of "cycle" cameras; thin leather bodied cameras with side-by-side cases mounted under the redesigned bicycle's top tube that held everything needed for hand-held picture taking. Strangely, Anthony, the company that started it all, was not along for the long ride. Yet the marriage of bicycles and cameras was more or less a trial. Anthony's and Scovill's outfits were nothing more than small field view cameras, which although portable, had large cases and were cumbersome to set up and use. The exceeding rarity of these first cameras is unexplainable; especially since Anthony advertised the Bicycle Camera nearly ten years. Could rarity be due to a lack of popularity or from inevitable events that destroyed the cameras such as crashes (often called headers when falling from a high wheeler) and tipping bicycles used as stands? Bicycles and itinerant photography finally enjoyed a healthy and prosperous relationship by the mid-1890s from two key innovations: safety bicycles (widely regarded as the most important development in the history of bicycles) and small self-casing, folding cameras.